I've been watching this thread for some time and thought I would share my own Journey and evolution with portable power for amateur radio communications. Not too long ago I was using in nickel metal hydride batteries, as the primary power source for my radio communications. Although I enjoyed using the Enelope nickel metal hydride batteries, their energy density is nothing compared to lithium ion or lithium iron phosphate. The price was right however. But after walking 40 kilometers on an off-grid emergency deployment exercise, I realize I needed to increase the storage capacity of whatever energy storage solution I decided to carry with me. That left me with two options. I did go on to use the nickel metal hydride packs with it pwm charge controller for quite some time. Now I've repurpose that charge controller, as a standby power go box with a 9 amp slab, wall mounted inside a small Pelican case. That's when I built the QRP battery pack http://oh8stn.org/blog/2017/06/08/diy-34s-li-ion-qrp-battery-pack/ . This first pack was a lithium ion battery pack with 3.4Ah capacity. I used four 18650 batteries in series and a battery balance and protection board, to manage low voltage, overcharge, Short Circuit, and balance the cells. I could connect the qrp battery pack to any of my solar panels, using the combination of battery pack and solar panel for sustained Communications in the field. Although the complexity of the build might seem daunting to many operators, the result is a stable lithium ion energy storage solution, with simultaneous charge and discharge capabilities. Fortunately I needed to use a DC/DC CC/CV power supply with the qrp battery pack. That was okay until later on when I found a better solution. The qrp battery pack was the first step in ultra-portable off-grid power for amateur radio. Unfortunately that pack could be looked at as nothing more than a rapid deployment, high speed low drag storage solution. Up until that point my solar panels we're still critically underpowered or overweight. I had the 10 watt solar briefcase from Harbor Freight. This was a total waste of money. Then I settled on two Goal Zero Nomad 7. The Goal Zero panels held me over for a while. They were not too heavy, they had both 12 volt and USB output and they could be chained together easily. Unfortunately their pieces of crap and the designer should be burned alive at the stake. The point of failure on The Nomad series of solar panels is the little box which holds all of the electronics. The cable breakout box works itself loose causing a short circuit in the worst-case or no connection at all. And despite their best marketing these is neither waterproof or water-resistant in any way. 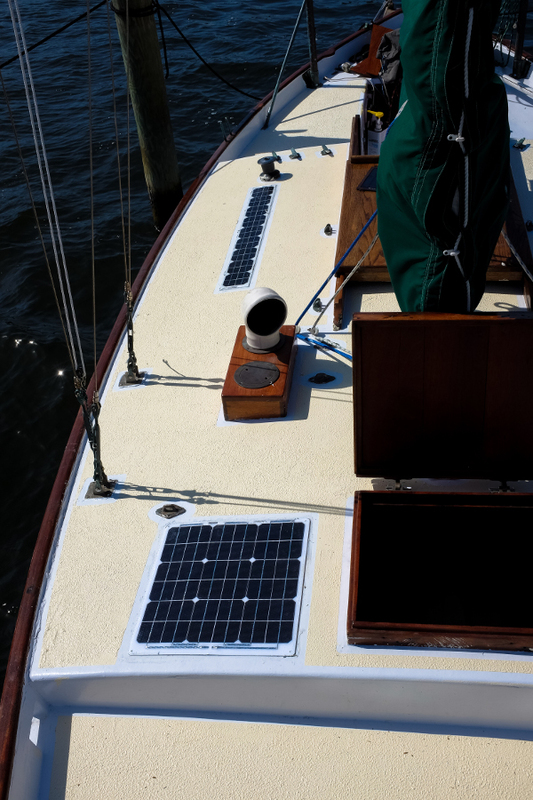 This led me to the PowerFilm F15-1200 20w http://oh8stn.org/blog/2017/06/16/portable-off-grid-power-for-amateur-radio-part-1/ flexible thin-film solar panel. By itself it weighs less than one of the Nomads, but brings in 1.2A of energy collection with a big reduction in weight. It can also be damaged without becoming completely useless. The only downside is the price. With the acquisition of a good panel I also needed to invest in a good solar charge controller. I'm pretty sure most of you will find this acquisition excessive, but it's my opinion that we spend too much money on trying to hack a solution together instead of buying the right thing the first time just once. 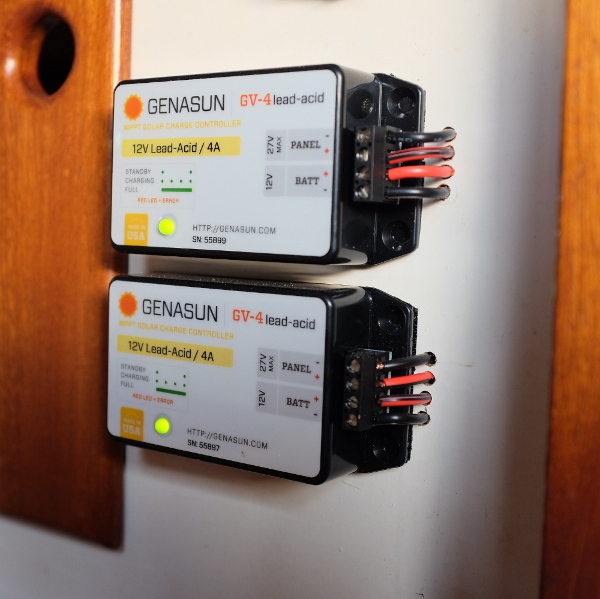 That brought me to the Genasun GV-5 solar charge controller for lithium iron phosphate batteries http://oh8stn.org/blog/2017/06/20/man-portable-off-grid-power-for-amateur-radio-part-2/ The Genasun is a 5 amp solar charge controller which is completely RF noise free! One can directly connect a lithium iron phosphate battery pack (with bms board), a solar panel, and a qrp radio on the load port. The BMS board in my qrp battery pack was compatible with both lithium ion and lithium iron phosphate depending on the input voltage. So to use my little qrp battery pack I simply had to swap out the lithium ion batteries for lithium iron phosphate 18650 cells. That was the Prototype! Last weekend (June 34 2017) at field day I used this combination of energy storage, solar collection, and Battery management to power my digital Field Station for 4 hours. I was using a digital mode called FSQ, to interact with two operators. The first operator was in the south of Norway, while the second operator was in Netherlands. Most of you already know I meant 65° North in Finland. We did text chat, exchanged images, interacted with the automated functions of FSQ, ... as a test for establishing reliable low-power digital Communications from the field. The test also confirmed that the combination of gear provided a lightweight Ultra portable off-grid power solution for field communications. So now that I know that everything works as one integrated system, it's time to increase the storage capacity of my system. The 3.4Ah pack does a great job in the summer months at 65 degrees north, because we have 24 hours of sunlight. For winter operations in the field I'm going to double up on the solar panels (adding a second PowerFilm F15-1200), and in the coming weeks start building a 10Ah version lithium iron phosphate protected battery pack. This offsets the fact that we have almost no daylight during the winter months. Finally a word of caution. I once review day cheap Chinese solar panel on my channel. It was called Choetech 19w folding panel. I finally realized the gimmick with these cheap Chinese panels. They all have a USB output, and they probably are accurate in regards to the potential wattage they can collect. However they deceive us when saying the USB output has two amp rating or 2.5 amp rating, because the solar panel itself could never generate that amount of amperage, without having several of those panels in parallel. They're not lying they're just not telling the whole truth. If you're into preparedness Communications, it's time to start building or buying your own quality gear. Very informative Julian, thank you! Do you think the 20W PowerFilm is worth the $220 when I can get a 50W foldable panel for $150? Is quality that much better? I use my Cheotech 14W with Nitecore UM-10 18650 chargers... I do need something beefier though... And "one is none, two is one..." My current problem is how to charge 24V Clansman batteries... Doing it from three or four 18650s is not going to cut it. I need a 14-15V source with at least a 10Ah capacity. Maybe just a gel cell, but the Cheotech isn't going to charge it since it doesn't have an 18V output and doesn't have the power. Is there a photo attached to this post? If so, it hasn't been approved and we can't see it. Here are all the photos and article behind them. To be fair, please send me a link to that 50 watt solar panel. I'll order one for the channel at some point and compare it against the PowerFilm. There should always be a budget option as long as we realize the budget option is not necessarily a one-to-one comparison. The Genasun controllers are amazing. I will order a second one with higher amperage rating, for the 10Ah battery pack I'm working on. I've had good luck with the Morningstar 10L & 6L (after mod) charge controllers also, but they only work with lead acid. My backup system uses the 6L, and the hamshack runs off of a 10L. Will you ever build a new boat Gil? Honestly, I've had so many different solar panels, and wasted so much money, that I finally just wanted to get the real deal. That was my thinking when I got the Aurinco panels at $300 for a 25W model. The Genasuns I bought on recommendations and reviews. Both were an excellent choice. "Well paid job" is an oxymoron in France though. No argument in your selection of Powerfilm - I would love to have a couple of those units, but I just can't justify the expense for my intended usage right now. I'm utilising a much cheaper, heavier and not nearly as hardy folding panel, but thus far it's been effective. The Genasun, LiFePO4 + FT817 are a great combination in my experience. If all goes to plan I should be operating portable in the near future, I have cut out as much weight as possible - will document it here if I can. I'm mainly a cw guy but really hope to work you and Gil on the air sometime soon. Yeah we all need to justify the costs find the balance for our needs. Looking forward to your show & tell. Here's the playlist for the portable power for ham radii series. There's also another battery build incoming http://oh8stn.org/blog/2017/10/12/4s2p-5ah-lifepo4-with-bms/ based on A123 26650 LiFePO4 cells. It's a 5Ah 4S2P protected pack with simultaneous charge and discharge in the field. I have really started to move away from this idea of counting on using what I can find in the field (eg 18650 batteries) versus building my gear the best way that I can in the first place. Puerto Rico and the island country of Dominiqu are perfect examples of a real preparedness or survival event. During the first week of the event, people were reaching out to ham radio operators through social media for news and information into and from the region. The biggest problems in Puerto Rico were ham radio operators lost their fixed operating locations, were forced to evacuate, had no grid power, and were lacking portable field renewable power sources. Where are we going to find fresh 18650 batteries, when the entire region is scrounging for them!? Now I focus on building my knowledge and skills on portable power, while simultaneously building my own reliable gear. This last part was just thinking out loud. "Can you, walk out the door, even only 100 feet away and be on the air in HF in five minutes?" Are you able to recharge your own station in the wild? Forget ARRL Field Day and other contests: this is about sustained communication with zero infrastructure, not giant motor homes, generators and photo-ops during a weekend. Where are we going to find fresh 18650 batteries, when the entire region is scrounging for them!? I like 18650s. They have a good capacity and can easily be found for free. You would of course have your stock ready before a situation develops, not count on finding them in the field, although there are plenty of laptops floating around. I also use them for flashlights and USB power banks. Those 38120s look very interesting for more current-hungry radios. A pack of seven would make a great Clansman battery, and give the PRC-320, which only draws 175mA, a lot of operating time, but at $32 per cell, ouch! I have a 7S LIPO but if one cell goes bad the whole pack is gone; no such problem with separate cells. The trick is of course is being able to charge them, and Julian, you are the expert here I'm following in your footsteps. Can you, walk out the door, even only 100 feet away and be on the air in HF in five minutes? Excellent question Ray; I can fortunately answer yes.